Janet Scudder, an American artist whose work has been as highly honored in France as in her native land, is known chiefly for her poetic and happy expressions of the out-of-door spirit. Her fountains and garden pieces are small and sportive but intensely sincere and never trivial. She has a pagan sense of natural imagery and a deep feeling for childhood. Her finish is delicate and perfect. 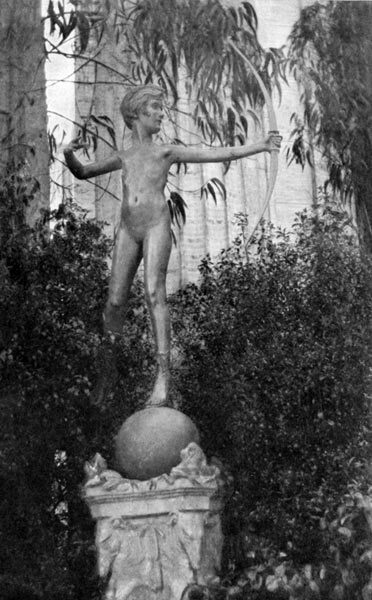 The "Young Diana," here illustrated, girlish, with singularly natural untrammeled grace - slender, beautiful and novel in conception - was awarded honorable mention in the Paris Salon of 1911. The young goddess of the chase, the moon and of maidens, is presented as still more of a maid than a goddess, glad with the freedom of girlhood, unconscious of her Olympian inheritance. Miss Scudder has received the distinction of having one of her fountains purchased by the Metropolitan Museum in New York. This is the Frog Fountain which, loaned by that Museum, appears in the Palace of Fine Arts. Her "Little Lady of the Sea," also here exhibited, received notable consideration in the Paris Salon of 1913. She is the holder of a silver medal awarded by the present Exposition.